Taipei, Sept. 10 (CNA) Premier Sean Chen said Monday that Taiwan will not recognize any sale of the Diaoyutai Islands in the East China Sea, as they are part of the country's territory. The Diaoyutais are the Republic of China's territory from a historical and legal perspective, he said in response to media questions about a reported imminent move by Tokyo to buy three islets in the Tiaoyutais. News reports in Japan said that Tokyo will purchase three of the four privately owned islets Tuesday in an effort to officially nationalize the island chain, which is called the Senkakus in Japan. "If there's anyone making deals (on that island group), we will never recognize the validity of such deals," Chen said. The Diaoyutais, five uninhabited islands that lie 100 nautical miles northeast of Taiwan, are claimed by the ROC government in Taiwan, as well as by China and Japan. At the end of World War II in 1945, the island chain was under U.S. jurisdiction as part of the captured Japanese island of Okinawa but has been under Japan's control since 1972 when Okinawa was returned to Japan. Japanese media reported Monday that the Japanese government is scheduled to sign a contract Tuesday to buy three of the Diaoyutais from the Japanese family that owns them, at a cost of 2.05 billion yen (US$26 million). 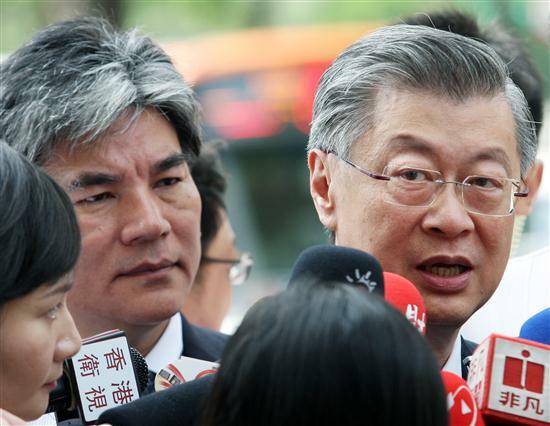 Sources at Taiwan's Presidential Office said national security and administrative units have been meeting in the past few days to devise strategies for handling the matter. The National Security Council has been closely monitoring the Japanese government's reported attempt to nationalize the Diaoyutais, and the government will respond to any new developments, the sources said. Meanwhile, head of Taiwan's Mainland Affairs Council Lai Shin-yuan said in London on Sunday that the ROC undoubtedly holds sovereignty over the Diaoyutais and Taiping Island, the largest of the Spratly Islands in the South China Sea. The Spratlys are claimed either entirely or in part by Brunei, China, Indonesia, Taiwan, Vietnam and the Philippines. Lai said it is not appropriate at this time for Taiwan to join hands with China in the disputes over the Diaoyutais and Spratlys because there is still an unresolved sovereignty issue between the two sides across Taiwan Strait. She was responding to a proposal by some Taiwanese expatriates in Britain that Taiwan and China should jointly defend their rights to the Diaoyutais and Taiping. Lai said that despite the warmer economic and trade relations between Taiwan and China in recent years, they have not yet reached a level of mutual trust that would allow for political talks.